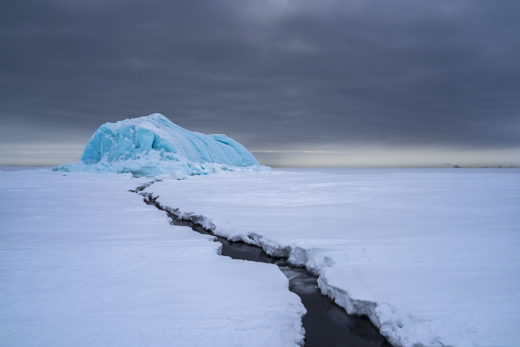 An exclusive trip to explore the wild north with photographer Scott Portelli. A voyage to the extreme north of the planet, across rugged icy landscapes, frozen fjords, ancient rocks, vast mountains and under a unique sky with a chance to see the dazzling Aurora Borealis (northern lights). This journey takes us into traditional Inuit communities, to learn the history and stories of a strong culture that has lasted the test of time. While hiking through Inuit land and exploring the coastline of this wild region we’ll be seeking incredible wildlife like polar bears, nesting birds, whales & caribou. 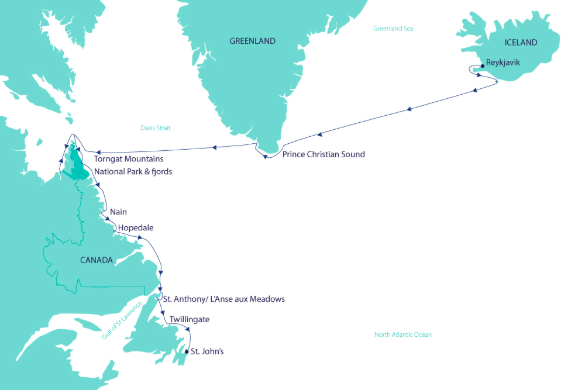 The voyage takes in the dramatic scenery of Torngat Mountains National Park, L’anse Meadows (11th-century Viking settlement), south Greenland and northeast Canada from the purpose build expedition ship. To register your interest to join us in the Arctic for this once in a life time experience, click here. In Reykjavik, make your own way to our group hotel. The remainder of the day is at leisure. Drive to Thingvellir National Park, a historical area where the Icelandic Parliament was founded in the 10th century. After enjoying a walk amongst the unique landscape of Thingvellir, continue to Gullfoss, a magnificent waterfall, considered to be one of the most beautiful in Iceland before transferring to the pier to board the Greg Mortimer in the late afternoon. The Westman Islands are situated just off the south coast of Iceland. The main island, Heimaey, has a population of about 4,000. Heimay’s main attractions are accessible on foot and you have the option of a guided walking tour including a visit to Eldfell volcano. Alternatively, discover the main attractions of the island on a city tour including Herjólfsdalur valley, to see the ruins of old Viking houses, drive Helgafell and ldfell volcanoes, and visit the Eldheimar museum that features specific exhibitions dedicated to the volcanic eruption that created Surtsey Island, a UNESCO world-heritage site. As we cross the Greenland Sea, our series of informative onboard lectures continues. Enjoy presentations about volcanology and geothermal activity, Greenland’s massive ice shelf, sea ice, glaciers and icebergs. Sea days also offer a great opportunity to get to know your fellow travellers and expedition team. We enter magnificent Prince Christian Sound – a famous channel in Southern Greenland connecting the Labrador Sea with the Irminger Sea. It is around 100 km (60 miles) long and can be as narrow as only 500 metres (1,600 ft) wide. The fjord is surrounded by steep mountains, reaching over 2,200 metres (7,200 ft) high. 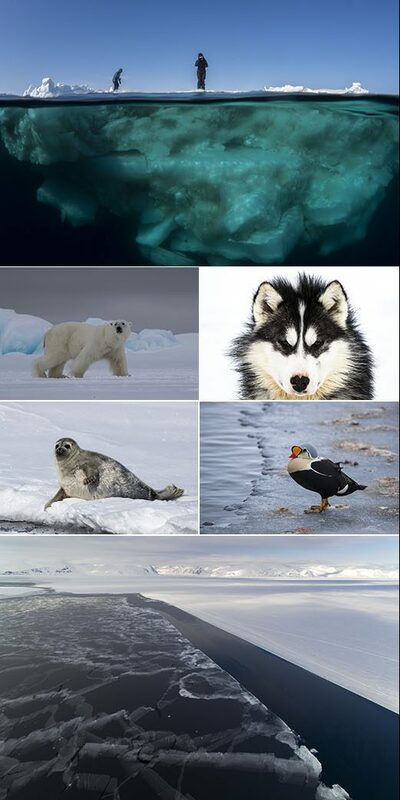 Many glaciers go straight into its waters where they calve icebergs. Enjoy a slow ship cruise through the sound soaking in the splendid scenery, great for photography. At Kangersuneq Qinngorleq fjord, weather permitting, we may take a Zodiac cruise and kayak at the glacier. At the southern part of the sound, pass Appilatoq, a tiny settlement famed for the extraordinary sharp mountain peaks that surround it, a delight for photographers. Tasermiut fjord is known as one of the most beautiful fjords in Greenland for its majestic mountains and lush valleys. At Klosterdal, we find ourselves amongst the three giant mountains of the area: Napasorsuaq, Ketil, and Nalumasortoq, where we may go ashore for a hike into the valley or explore the area by kayak. Sail through the fjord towards Nanortalik, an area with a landscape unlike other areas in the country featuring deep fjords, small woodlands and grasslands, and rugged mountainside cliffs. Receive a very warm welcome from the local community who have opened up their town for you to explore. Visit Nanortalik Church, a wooden, Danish Lutheran church built in 1916, and Nanortalik Museum with exhibits featuring summer tents, kayaks and the oldest cargo boat ever discovered. Narsarsuaq offers easy walks, which include Norse ruins, Inuit graves, and old farm houses. Paddlers may also have the opportunity to explore the little peninsular on kayaks. Uunartoq island is located halfway between Qaqortoq and Nanortalik. Hot springs are abundant in South and West Greenland, but Uunartoq island is home to the only hot springs in the country that are warm enough to bathe in. What’s unique about Uunartoq is that the hot springs are in a completely natural environment in the middle of a grassy field. People have appreciated Uunartoq’s remedial springs for more than 1,000 years and now you can too. Aside from soaking in the thermal springs, there are plenty of opportunities to explore the remnants of 500 years of different building styles and communal graves in the area. Hvalsey Church is the best-preserved Norse ruin in Greenland. ‘Hvalsey’ is old Norse for Whale Island. Christianity arrived in Greenland around 1,000 and gradually churches began to be built. Hvalsey itself was built in the early 14th century, but it was not the first church built on this site. The overall Hvalsey site comprises farm and church buildings. The church might have been built by Scots-Norse stonemasons, as similar structures are found in Norway and Orkney. After exploring Hvalsey ruins, we continue to Qaqortoq, where our Zodiacs take us ashore. Qaqortoq is the capital of South Greenland, and the town offers many cultural activities and just walking around, you will experience the “Man and Stone” art project, designed to transform the town into an open-air art gallery. Other activities may include a walking tour guided by local students, watch a kayak performance, sample local delicacies, or simply stroll around the picturesque lake. After a busy first week, enjoy some down time to attend informative and entertaining lectures ahead of our arrival into Canada’s spectacular and remote East Coast. Our team of experts may present on the incredible geology or the rich wildlife found in the Torngat Mountains National Park. Kangiqsualujjuaq (George River) is the easternmost village of Nunavik region in Quebec province. For adventure and nature lovers, the surroundings of Kangiqsualujjuaq are full of natural attractions and common wildlife found of the area include Caribou, black bear, fox and wolf. About 100 km to the east of Kangiqsualujjuaq are the Torngat Mountains. We are privileged to visit Kangiqsualujjuaq community, where you will meet with friendly locals who are proud to show you their home and introduce you to the distinctive characteristics of their cultural and linguistic heritage, art and stories. Discover the splendid Autumn tundra on a short hike. The world’s largest caribou herds roam freely in Nunavik. Torngat Mountains National Park is a mysteriously beautiful landscape reminiscent of Earth a million years ago. It takes its name from the Inuktitut word ‘Tongait’, meaning place of spirits. It is 9,700 square kilometres of spectacular wilderness, a land of mountains and polar bears, small glaciers, and caribou, where the Inuit hunt, fish, and travel, as their predecessors did for thousands of years.The Torngat Mountains are also home to some rock formations about 3.92 billion years old, making them the second oldest in the world! Over the next two days, we’ll explore the deep fjords and channels by ship, Zodiac cruising through some of the most spectacular and dramatic landscapes found anywhere in the world, and getting out for hikes, searching for wildlife, visiting archaeological sites. Weather conditions and tides will determine our itinerary and landings during our time exploring Torngat Mountains National Park. We may sail through Eclipse Channel or Nachvak Fjord, a deep and narrow fjord stretching more than 20 kilometres with rocky walls of the fjord soaring almost 900 metre above us at several points. Around the southern part of the national park in places such as Saglek Fjord, we’ll attempt look for polar bears roaming the rocky shores of the outlying islands of the park on their hunt for food. Autumn brings shorter days and when the sun goes down, look up. Chances are, you’ll see something to take your breath away – bright green ribbons of light dancing and swirling across the night sky. You are in the zone of the Aurora Borealis. Brilliant, exhilarating and utterly unforgettable, the Northern Lights are the crowning glory to the dramatically beautiful Torngats. As we sail south to Nain, our onboard lecture series continues and you’ll learn about the history of Moravian missionaries as we sail south to Nain. Spend your free time catching up on editing photos and relaxing in the various public areas, stay active in the fitness centre or unwind in the wellness centre. Nain is the most northern and largest community in Nunatsiavut. Founded in 1771 by Moravian Missionaries, Nain was an important outpost for the missionizing efforts of the Moravians. Beautiful artefacts and buildings built by the Moravians remain in the community to this day. In smaller groups accompanied by local guides, you will be taken on a walking tour visiting the town’s key sites including the Moravian church; Torngat Arts and Crafts Gift Shop; Illusuak Cultural Centre and perhaps see a demonstration of stone carving by a local carver. Time permitting, there may be a chance for a hike to Mount Sophie, escorted by local Inuit bear guards as bears are frequent in the area outside of town. Located in the heart of Nunatsiavut, Hopedale is the legislative capital of the Nunatsiavut Government. Originally known by its Inuktitut name Arvertok, which translates to “the place of whales”, the community was renamed Hopedale by Moravian Missionaries arriving from Germany in 1782. Today, there remains an incredible legacy of structures and artefacts from the Moravians in Hopedale. Some of the oldest wooden-framed buildings in Canada still stand in Hopedale. Take a walk through the Nunatsiavut Assembly Building and learn about the local labradorite and seal skin materials found throughout. Browse through the Moravian Mission Museum Interpretation Centre to view three storeys of artefacts and written materials collected since the late 1700’s. Battle Harbour is a restored, 19th-century fishing village on a small island in the Labrador Sea. Regarded by generations as the unofficial capital of Labrador, it was once the salt fish capital of the world and also a government centre bringing medicine and supplies to Indigenous communities to the north. Welcome to a place without power lines or cell towers, without cars or paved roads, you can walk footpaths worn by fishermen and merchants centuries ago. Spend a few hours in Battle Harbour exploring the buildings and walking the trails on this island with local, knowledgeable hosts. Hiking the island reveals its Arctic vegetation and rock formations. In this sub-Arctic region, the dark Autumn night sky is full of bright, gigantic stars occasionally joined by the northern lights. L’Anse aux Meadows National Historic Site contains the excavated remains of a complete 11th-century Viking settlement, the earliest evidence of Europeans in North America. This and subsequent archaeological discoveries proved Leif Erickson and crews of Norse explorers settled here in Newfoundland and Labrador (or Vinland as they called it). L’Anse aux Meadows was declared a UNESCO World Heritage Site in 1978 and is the first authenticated Norse settlement in North America. Wander the new world home of Leif Ericson and learn about the sagas and technologies of the Norse that explored North America over 10 centuries ago. On today’s other shore excursion, learn the fascinating story of Dr. Wilfred Grenfell, a young English doctor renowned for bringing medicine and education to the Inuit and poor European settlers along the harsh Labrador Coast. Twillingate is known as the “Iceberg Capital of The World” because of the many icebergs that flow past its shores from Greenland in early spring and summer. Twillingate offers many features and attractions that Newfoundland and Labrador outports are famous for: stunning coastline, and historical and picturesque streets. Our shore excursions today will use local guides and school buses (Long Point Hike option available) to travel between the region’s most popular attractions: the Auk Island Winery, the Prime Berth, the Long Point Lighthouse and the Twillingate Museum. After a leisurely breakfast, bid your fellow travellers, new friends and expedition team a fond farewell before disembarking in St. John’s. Since 1497, explorers, adventurers, pirates and all manner of seafarers have found their way into the spectacular harbour of St John’s. A legendary seaport on the edge of the continent with a rich 500-year seafaring history. St. John’s is North America’s oldest European-settled city and is the capital of Newfoundland and a place well worth spending a few days at the end of your voyage. Wander the colourful Victorian streets with plenty of heritage shops, boutiques, art galleries, fine restaurants, bistros, and pubs – just steps from dockside. If you want to join us to explore this remote wilderness, then contact me.